Porting data between different software systems is a defining aspect of our tech society these days. And the connective tissue bringing it all together? Application Programming Interfaces – better known as APIs. APIs have taken over the software world. Between 2005 and 2015, we saw the number of APIs go from a few hundred to more than ten thousand! The capabilities of any one system are greatly enhanced by APIs that connect them to different, complementary platforms! Adobe Connect has long embraced the open API model. It has tremendous platform extensibility that’s helping everyday users like you and me! But what does that mean? We’re digging into it here! Adobe Connect has put in a lot of work to ensure its platform is highly extensible and open to as many options as possible! What does Platform Extensibility Look Like? To understand the value of platform extensibility, you need understand what it looks like in Adobe Connect. Adobe Connect’s unique architecture makes it one of the few platforms where you can introduce app functionality in the room. Sure, some platforms integrate social media elements. Adobe’s custom pods go much further toward creating new and fun ways to interact. You can visit the full custom pods page here, and we’ll look at a few below. The pods available are built solely for Adobe Connect. That means a lot of custom experiences can only happen in Adobe Connect meetings, trainings, and webinars. Imagine how exciting it would be to lead a live online learning session with a unique game that your learners will have never played before! The best part is that many of the pods are free! Custom integrations are used to provide access to Adobe Connect from other platforms. There are a variety of integrations that exist in the Adobe Connect ecosystem. All of those great features we talked about in our other blog, “What Makes Adobe Connect Different? Feature Richness,” are available with every virtual classroom you port into your LMS. Adobe Connect also integrates with Salesforce, Marketo, and Eloqua. 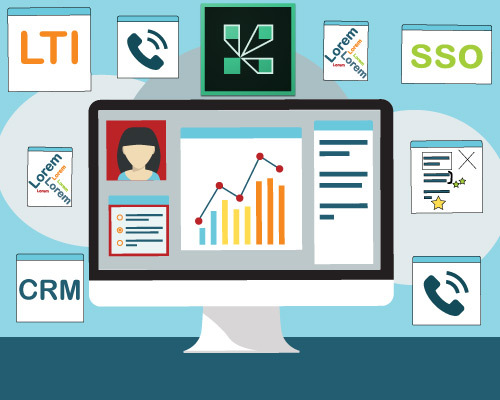 These integrations become critical for marketing managers who run webinars. 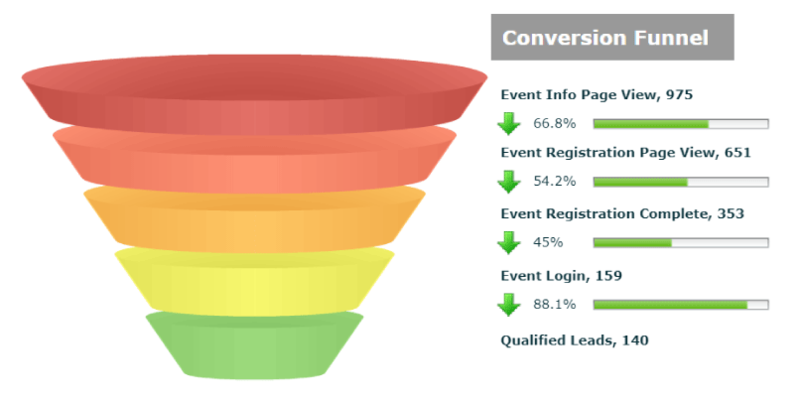 Adobe Connect offers built-in email and landing pages that track landing page visits, registration page visits, event registrations, and event attendance. Pairing this information with things like email open and click rates gives marketers insight into the success of their campaigns. This is only possible thanks to Adobe Connect’s open API. Adobe Connect thrives in a reseller ecosystem. There is a small legion of companies that partner with and resell Adobe Connect. Value-Add Resellers (VARs) like MeetingOne help to keep Adobe Connect dynamic. Each partner brings a unique perspective to the platform, and we’ve collectively shaped it to be powerful. We’ve seen a number of the Value-Add Resellers (VARs) introduce great tools. For example, there are several SSO and other authentication tools on the partner market available to users. Along these lines, there is an abundance of LTI options created by Partners. MeetingOne competes with partners like eSync, Refined Data, and InvataCloud to create the best technology. (We like to think ours is the best. ) Partners cover a vast spectrum of LMSs. While much of the competition only integrates with Blackboard, D2L, and Canvas, VARs also connect Doodle, Sakai, and the SAP Enterprise Learning platform to Adobe Connect. All of this competition lends itself to creating great products! MeetingOne has been a big part of the ecosystem. We’ve developed a number of integrations for Adobe Connect, but we’re most proud of two: Our telephony integration & our Outlook plugin. We developed an audio integration for Adobe Connect that allows users to incorporate reliable telephony into their online meetings or events. Telephony is a good alternative to VoIP, as your voice and audio aren’t dependent upon bandwidth. Our integration also introduces call icons to the Adobe Connect Attendee List pod. 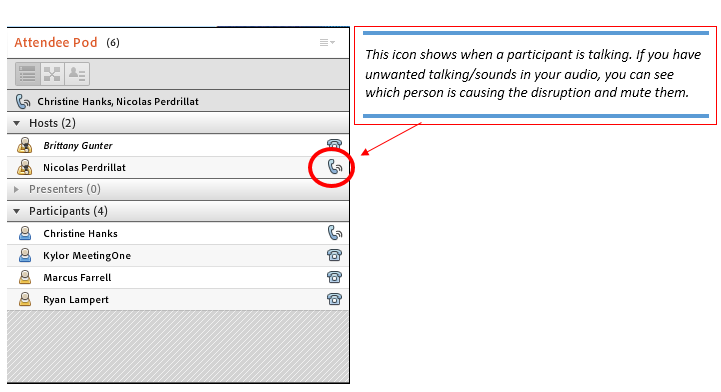 These icons indicate to hosts which attendees are talking, dialing in, connected, or muted. Our integration features an easy to turn on and off Lecture Mode, which allows hosts to more seamlessly move between presentation and group discussion. Another benefit of platform extensibility is that a lot of the technology developed around Adobe Connect is very use case specific. This is particularly true for EDU and online training use cases. Let’s look at two categories of custom pods: Fun & Educational. Rock, Paper, Scissors has never been more enjoyable than in the virtual environment. 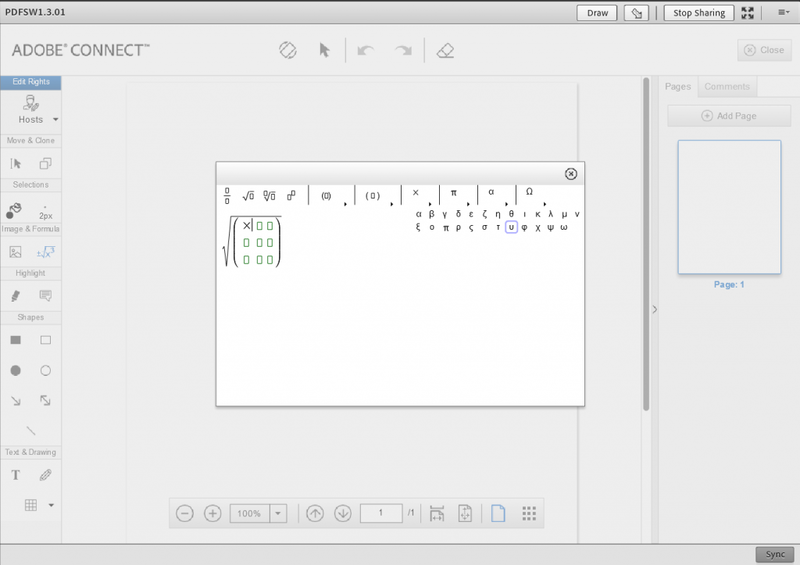 Roshambo is a fun way to start a session or entertain learners leading up to a class. Upload and play your favorite MP3 songs! We often use these songs as a hold music substitute before events. Transform a chat session into a fun-for-all where people can list the things they associate with any given topic. 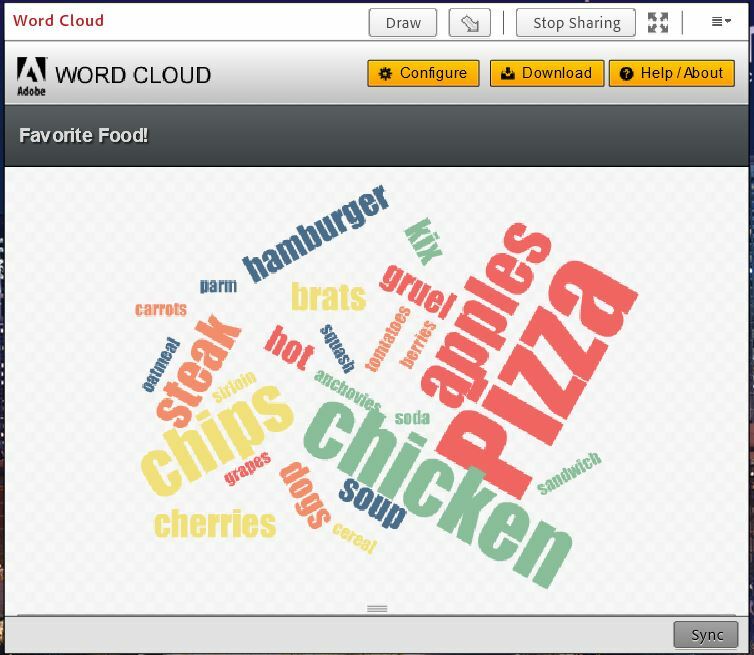 Word Cloud is another custom pod we’ve incorporated into several of our webinars. It spurs engagement after long segments of lecturing. You can ask about almost any subject. We’ve alighted on two topics that work: Favorite food/breakfast food or countries visited. While the above apps are simply fun, there are a number of apps that hold educational value. Let’s look at two of the best. The EduGame Cloud includes customizable educational games, training tools, and student management resources to optimize cloud-based training and learning through Adobe Connect. The platform allows you to create and administer custom quizzes, crosswords, tests and surveys, and monitor student progress. Ideal for all types of e-learning curriculum, the gaming components help to make concepts more accessible and engaging. The EduGame Cloud is a potent tool for fostering increased student attention and comprehension. The PDF Smart Whiteboard allows users to author, annotate and collaborate on documents easily within Adobe Connect. More powerful than the standard whiteboard, the PDF Smart Whiteboard allows for the addition of customized stamps and images that are relevant to your subject matter. The new LaTeX formula editor enables real-time equation building to enhance mathematical workflows within the system. We’ve heard of a number of math and science teachers gleefully using the LaTeX formula during their online classes. Activity logs capture all annotations and save them to your user library. These documents can be accessed as many times as needed. All files can be collected and used offline to continue collaboration anytime, anywhere. Teams focused on engagement and collaboration within the virtual meeting room and classroom will love this tool! Between EduGame Cloud and the Smart Whiteboard, it’s hard to beat the type of unique interactions you can create for your eLearning or EDU use case. Everyone wants their online meeting, training or webinar experiences to be fulfilling for their participants. Platform extensibility is the key. It allows the use of Adobe Connect in unexpected places – like your on-demand learning course! Or, you can use it to place custom apps in your Adobe Connect events. They’re great for keeping people engaged throughout. Trial Adobe Connect to experience the difference firsthand! Check out some of the Custom Apps for Adobe Connect we would recommend!